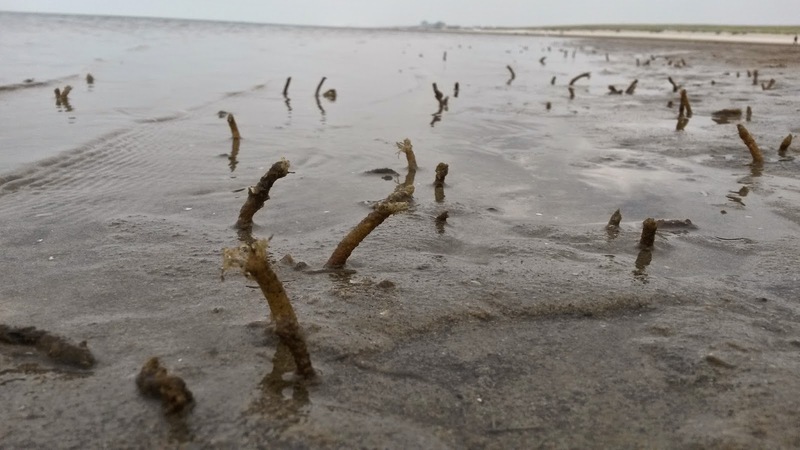 MEGAPEX: The beach maintained by worms? Tube building worms in the intertidal zone of the Sand Motor lagune. With the wind blowing in your face and the waves roaring furiously, only few scientists observe the tiny engineers on the bottom of the sea, working hard to shape their surroundings. We find all kinds of benthic creatures at our coastline and their physical presence alone affects sediment transport. To what extent can they shape our coastal landscape? The Royal Netherlands Institute for Sea Research (NIOZ) is trying to find out. Today we started an experiment placing artificial beds of tube building worms at the Sand Motor. Over the days we will measure bed elevation under different environmental conditions. Artificial bed of tube building worms deployed in the intertidal zone.